A young American woman arrives in Florence from Boston, knowing no one and speaking little Italian. But Hannah is isolated in a more profound way, estranged from her own identity after a bout with starvation that has left her life and body in ruins. She is determined to recover in Florence, a city saturated with beauty, vitality, and food?as well as a dangerous history of sainthood for women who starved themselves for God. ...[a] thoughtful, provocative first novel ... The novel’s pleasures arise from the jostling together of elements that vitalize and dimensionalize its story: the beauty and rhythms of the fabled city, its locals and visitors, seasons, festivals, food and drink, surrounding countryside and townships, art and architecture, and, never least, the music of the Italian language (a sprightly character unto itself, easily understood because of the deft way Chaffee sets it in context) ... Never didactic, never an infomercial, Florence brings readers on a gentle tour of the glorious city and adjacent areas, of its habits, history, art and books. At the same time, the novel examines some of the ways an anorexic mind perceives the world and itself. 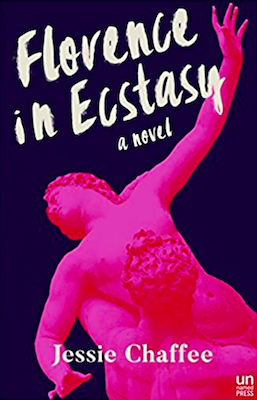 Like the appealing anguish of those women's lives, Florence in Ecstasy is a beautiful but exhausting novel. Hannah is perpetually precarious; every accomplishment feels hard-won, and every loss feels inevitable ... As you might expect, this is not a light beach read; it is something that must be taken in small doses and savored page by page. But if you can ride out the unyielding waves of pain, there is a classic but reimagined narrative at work here: a person's existential reckoning on unfamiliar soil. In this case, a woman on the edge, in a liminal city that sits between the past and the present, searching for her missing body — which is to say, herself. [I became] engrossed in its haunting pages ... the way Chaffee writes Hannah’s eating disorder cuts to the core of the psychology that is rarely the focus of eating disorder narratives, even though it is at the center of so many eating disorders themselves ... Society’s fixation on unrealistic bodies does not help, but eating disorders are broader, wider and deeper, and Jessie Chaffee succeeds admirably in mining them as she depicts a woman’s journey away from her earthly self – and then back again. What did you think of Florence in Ecstasy?